The head of the U.N. nuclear watchdog agency says it’s his "gut feeling that Iran definitely would like to have the technology" enabling it to possess nuclear weapons. 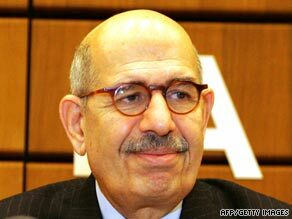 Mohamed ElBaradei, the director-general of the International Atomic Energy Agency told the BBC this week that Iran wants to “send a message” to its neighbors and the rest of the world: “Don’t mess” with Iran and “we can have nuclear weapons if we want to.” ElBaradei made the remarks as political upheaval swept through Iran, where thousands have staged street protests over what they felt was last week’s rigged presidential election — a contest in which the government says incumbent President Mahmoud Ahmadinejad won handily. Iran consistently says it wants to harness nuclear technology for peaceful purposes, but there has long been great suspicion in the West and elsewhere that Iran is intent on producing nuclear weapons.